This digital intraoral scanner creates 3D colour images of the teeth in minutes. It is a fast and comfortable experience for the patient, and the results are very accurate. A lot of dentists who haven’t moved on with the times simply chart the teeth by calling out to the nurse who enters the information onto a computer. 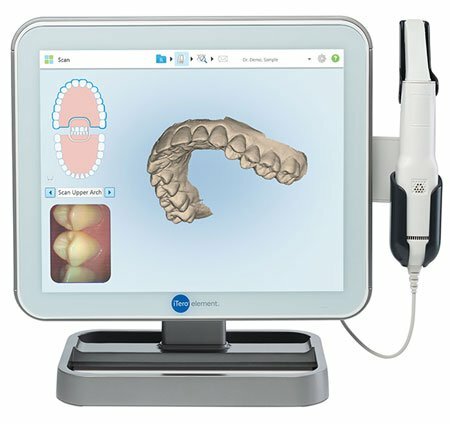 With this scanner, we get a patient in, have a chat and quickly scan all the teeth. The results are automatically added to the patient file and appear on a screen that the patient can see. Rather than trying to persuade people to have a certain treatment, the patient often looks at the scan and requests a solution to their problem. The image can be manipulated in a number of different ways. It appears on a screen similar to an iPad and the patient can use a finger to turn it in any direction. The scanner has Invisalign technology built into it that helps streamline the whole process. It allows patients to see a photo of themselves before treatment and after. When a patient comes in for a six-monthly check-up, it’s possible to overlay their last scan with a current version to see if there are any changes. I’ve had a couple of cases where patients have seen the effect of their teeth grinding and requested a solution. One negative is that some patients are very resistant to this kind of technology. They just want to come in, have the basic check-up and clean, and leave. I guess technology can be a bit overwhelming for some of the older generation.